Whether you are celebrating Earth Day, clearing out your old financial documents or just doing some spring cleaning , many organizations are holding events for the public to drop off unwanted items for proper and safe disposal. Here is a list of some of those events. Most of them are in the Austin, TX area. The Drug Take Back event is Nation-wide. Check your local area for many similar events. Free Electronics Recycling in Austin this Saturday, April 26th. 7 a.m. to 6 p.m. in the parking lot at Austin High School at 1715 W Cesar Chavez Street. AAA Texas in partnership with Cintas, is holding three free Shred-a-Thons on May 3 from 10am to 1pm. AAA members may bring up to FIVE boxes or paper grocery bags filled with personal papers for on-site shredding. The AAA Branches offering this service are: Austin North, Houston-The Woodlands, and Fort Worth. Branch locations are available at www.AAA.com/branches. 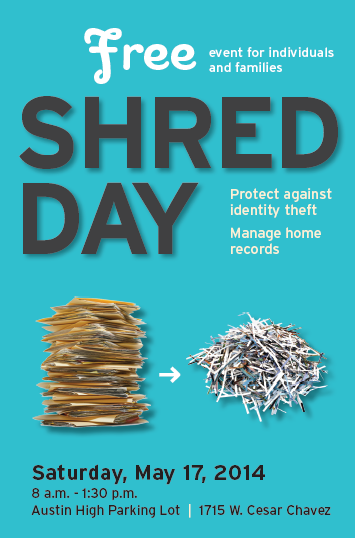 Free Shredding Day – May 17, 2014! The Austin chapter of ARMA International is sponsoring their 11th annual free SPRING Shred Day. With the increased awareness of identity theft, it’s important to carefully dispose of personal records. Households can bring up to five boxes of paper records per household. All of the shredded material is recycled. Please make sure your records are paper only (no hard plastics, no plastic bags, electronic media or three-ring binders) and are not wet or moldy. Mobile shredding trucks will be provided by Balcones Resources, Cintas, and Iron Mountain. ARMA International is a not-for-profit professional association and the authority on governing information as a strategic asset. Visit http://austin.arma.org/ for more info! Yesterday I was working with a client in his home office and we were discussing shredding of old documents. It occurred to me that some people know the importance of shredding some of their materials, but they get concerned about the cost. There are essentially 3 levels to think about. If you have a very large number of old documents, it is most cost effective to hire a company to pick up your boxes and shred them. If you have 1-3 boxes, it is most effective to go to a local retailer that charges by the pound. 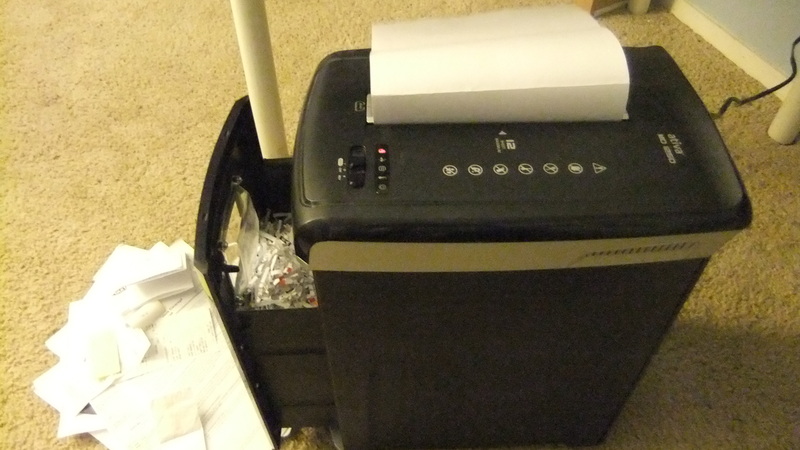 If you have less and once you are on a regular routine, invest in a decent shredder for your home or office. all of these have some level of expense involved, but the protection of your identity and finances are worth the relatively small expense and effort. Fortunately, in most communities, there are organizations that hold periodic shredding events that are free for the public. In Austin there is one tomorrow, November 9th. Mark you calendar for Saturday, November 9th, 8:00 a.m. to 1:30 p.m. at Balcones Shred (9301 Johnny Morris Road). Households can bring up to five boxes of paper records per household for shredding. Box size should not be larger than 24” X 24”X 36”. All of the shredded material and cardboard boxes are recycled. Please make sure your records are paper only (no hard plastics, no plastic bags, electronic media or three-ring binders) and are not wet or moldy. Monetary donations will be accepted with a portion of the proceeds going to Blue Santa. Please note the change in location for the fall shred day. The event will be held at 9301 Johnny Morris Road. For more details regarding the free household shredding, contact Dana Simpson at Dana.Simpson@BBVACompass (512-453-0250) or William Basinger at wtbasinger@gmail.com.